GLASTONBURY, Conn. - As the sun rises over a sprawling berry farm in South Glastonbury, a trained falcon rises into the pink dawn. 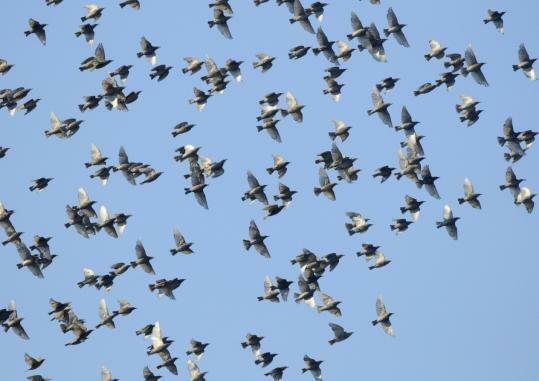 Its swift, sudden appearance panics a cloud of starlings and sends them fleeing toward the hills. Behind this breathtaking scene, hundreds of thousands of dollars are at stake. "It's a war out there," said Erik Swanson, a licensed falconer. Starlings can cause more than $100,000 in damage to a half-million dollar blueberry crop. Accompanied by eight trained falcons, Swanson is spending August at Rose's Berry Farm. Working 11-hour days, seven days a week, he and his falcons - which are trained to chase the birds away, not to kill them - will protect the blueberries. This is the second year that Henry and Sandy Rose, owners of the 100-year-old, 100-acre farm have hired Swanson, an employee of Falcon Environmental Services Inc., based in Plattsburgh, N.Y.
A growing number of farmers in the United States are turning to falconers to protect their crops. As more farmers find their fields hemmed in by suburban developments, the old methods of wildlife control noisemakers, shotguns, and poison are less tolerated. "Everything we did, our neighbors did not like," said Sandy Rose. At a cost of about $400 a day, the falconry service is more neighbor-friendly than the 120-decibel propane cannons the Roses once used to rout the starlings, and it doesn't bother the farm's visitors or customers, who pay $2.25 a pound for pick-your-own blueberries. Starlings typically eat insects and grubs, but when the blueberries appear, they "go sugar crazy," Swanson said. Three years ago, starlings destroyed 20 percent of the crop. Up until 10 years ago, the Roses used an insecticide to control the starlings. "It irritated their throats, and they'd give off a distress call," she said. But the chemical, which also controlled blueberry maggots, is no longer available. The alternative - covering the farm's 40 acres of blueberry fields with nets - would have cost more than $200,000. The couple settled on propane cannons and traps, even shooting a few birds. But the neighbors complained. After reading about a California vineyard that successfully employed falcons, Henry Rose decided to hire Falcon Environmental. The privately owned company provides airports, including John F. Kennedy International Airport in New York City, and landfills with ecologically friendly methods to disperse birds and wildlife without harming them. It's a business that's appealing to a growing number of farmers. "It seemed to work. Last year they were controlled very well," Sandy Rose said.